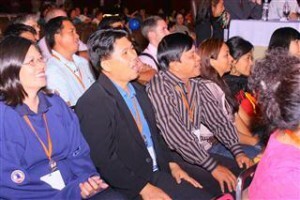 The International Committee on SeafarersÃ¢â‚¬â„¢ Welfare (ICSW) recently participated in the first ever International Seafarers Family Convention (ISFC) held last 4-5 August 2011 at the Philippine International Convention Center. The ICSW came in as one of the major sponsors of the event organized by the Gig and the Amazing Sampaguita Foundation Inc. (GASFI). With funding support from the ITF Seafafrers’ Trust, the ICSW was able to mobilize its Regional Committee in Southeast Asia to sponsor seafarers and their families from the region to participate and attend the well organized Conference and Exhibition. Over 30 delegates, together with their families from Indonesia, Thailand, Vietnam, Malaysia and Singapore were sponsored by the ICSW to attend the very first family event for seafarers. 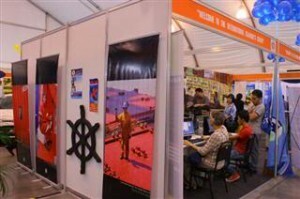 ICSW’s booth at the Exhibition Hall was a crowd drawer as it put up a mock-up seafarers’ drop-in center, complete with life-size full wall pictures of an actual operating center. It made the booth look so animated and full of activities. Add to that, it had scores of different give-aways for its many visitors. 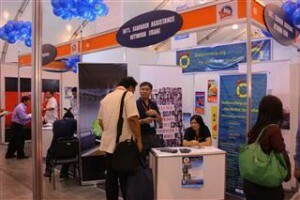 Internet enabled personal computers through a wireless fidelity connection were also installed to allow booth guests to register on-line with the Save Our Seafarers (SOS) Campaign. 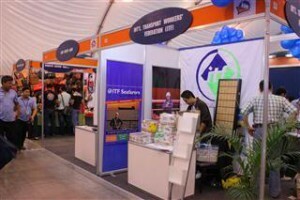 At the time of the exhibit, the Philippines had the most campaign registrants. Also, before the end of the event, the campaign reached and exceeded 20,000 supporters from all over the world since it was launched early this year. AMOSUP-PTGWO-ITF, the largest seafarers’ organization in the region, has supported the SOS Campaign from its inception and to this day continuous to encourage its members and constituents in its numerous facilities nationwide to register their support the campaign. It strongly believes that the piracy menace can be stopped with deliberate actions, clear political will and absolute cooperation of all industry stakeholders from all over the world, including the relevant international bodies of the United Nations. 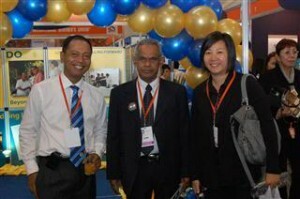 AMOSUP was also a major sponsor of the event, being a key player in the maritime manpower industry. It continues to cooperate with the convention organizer, GASFI, in its efforts that give meaning to the seafaring profession and uplift the lives of seafarers and their families. Thus, the union’s leadership saw it fit to fully support the First International Seafarer Family Convention and believes that the basic unit of society, the family, is the key to keeping a productive and efficient maritime workforce. 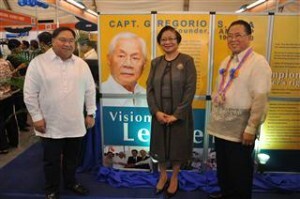 The union’s exhibit showcased its welfare programs for the general membership and their dependents – the seafarers’ families, and its founding Chairman’s vision for the maritime industry (Capt. 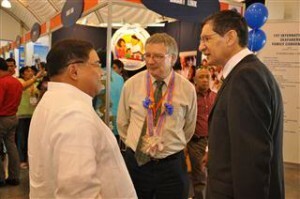 Gregorio S. Oca) – the union’s benefit systems which came to fruition over the years because of the social partners’ cooperation and the general memberships’ continued trust. Also collaborating with the ICSW as booth exhibitors were three (3) other London-based organizations – the International Transport Workers’ Federation (ITF), the International Seafarers’ Assistance Network (now known as Seafarer Help), and the Maritime Piracy: Humanitarian Response Program booth. The ICSW has shown real interest in the Philippines in the recent years and has actually funded and approved for funding various projects in several major ports – Cebu, Bohol, Cagayan de Oro, Davao and Manila. 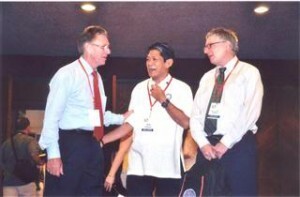 In 2010, it sponsored the Party in the Park for seafarers and their families at the time when an IMO Diplomatic Conference was being held in Manila to revise the Standards for Training, Certification and Watchkeeping Convention. The project in Manila will be the very first Seafarers’ Drop-in Center at the South Harbor and will be undertaken in cooperation with the Port Workers’ Union of the Philippines (PWUP) and AMOSUP. PWUP is a dockers’ union affiliate of the ITF. Before the end of 2011, the Seafarers’ Drop-in Center in Manila will start operating to harbor foreign and Filipino seafarers whose ships will be docking at the Manila South Harbor. There is currently no convenient center close enough to the port where these seafarers can safely enjoy shore leave – a place with adequate recreational and communication facilities, similar to those found in major ports in other countries. The ICSW is a charitable organization, largely funded by the ITF Seafarers’ Trust, partly by some donor institutions and other benefactors. 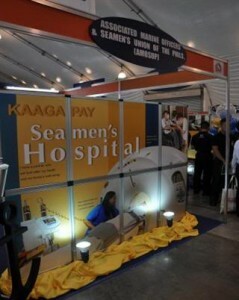 Its major aim is to identify areas where seafarers’ welfare facilities are absent yet needed. Its Regional Development Program, launched two (2) years ago, has been very active in identifying seafarers’ programs and projects in Southeast Asia focused on seafarers’ well-being and welfare.